A giant iceberg that broke off of a glacier in Greenland has advanced towards the sea and is set to enter a strait separating the Danish island from Canada. It could pose a problem for ships navigating through the narrow strait. ­A satellite photo taken by the Moderate Resolution Imaging Spectroradimeter (MODIS) on NASA’s Terra satellite reveals that the Manhattan-sized iceberg, dubbed PII-2012, which cleaved from the Petermann glacier last month, traveled 14 miles (22 kilometers) southward and is about to reach open waters. Andreas Muenchow, an associate professor at the University of Delaware who has been tracking the breakaway iceberg, wrote on his blog that the object was traveling at a speed of 1.25 miles (2 kilometers) a day at the end of July, up from 0.6 miles (1 kilometer) per day reported earlier. 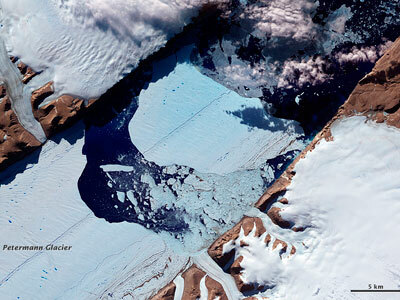 The researcher predicted that the glacier would float into the ocean around August 4. The researcher also warned of the potential ramifications the iceberg's presence in the Nares Strait could have on sea navigation. “Without a break-up, it is big enough to block the channel as another large ice island did for almost six months in 1962,” Muenchow wrote. 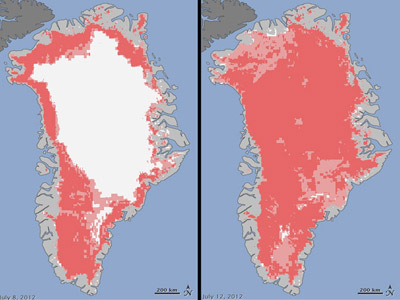 Record temperatures have caused almost all of Greenland’s surface ice shield to melt, as shown by NASA’s satellite imagery. 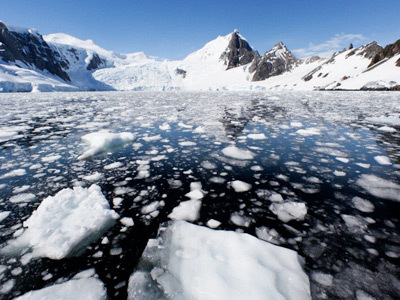 However, Muenchow suspects that the iceberg’s secession from its parent glacier had more to do with ocean temperatures, rather than the air temperatures in Greenland.